Indefinite immigration detention is a shocking human rights abuse that’s happening on a huge scale right here in the UK. Our government locks up around 27,000 people every year for immigration purposes. This includes survivors of torture and human trafficking, asylum seekers and long-term British residents like the victims of the Windrush scandal. Time in detention ranges from days to weeks or even years. Decisions to detain indefinitely are made by Home Office immigration officers. No courts or judges are involved – very different to how we deal with even the most serious cases in our criminal justice system. A crisis of harm is unfolding in our detention centres. This includes serious physical and mental health problems, suicide, and an epidemic of self-harm, which has become a daily occurrence. This is unacceptable, but an inevitable consequence of detaining vulnerable people indefinitely. The purpose of immigration detention is supposed to be removing migrants from the UK. But the majority are released, not removed. Our system detains people only to release them again, back to their families, back to their communities, the detention having served no purpose in concluding their immigration case. The cost has been half a billion pounds over four years – more than £30,000 per person per year. The Home Office has also paid out £21m in just five years for wrongfully detaining 850 people in immigration detention. Indefinite detention is not an issue of the left or right, or any political party. It’s about human beings and human rights, due process and justice. 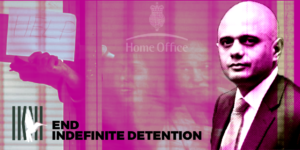 MPs from across Parliament have joined forces in condemning indefinite detention, and calling for a time limit. Here’s how MPs have described indefinite detention in Parliament recently.